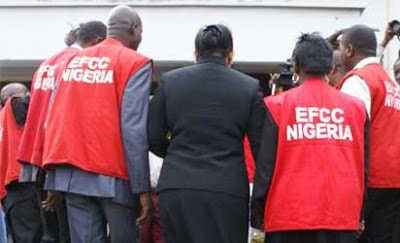 The Economic and Financial Crimes Commission, EFCC, today arraigned the trio of Giwa Useni John, Pius Iorye Uganden and Nancy Uganden before Justice O. A. Otaluka of the Federal Capital Territory, FCT, High Court sitting in Lugbe, Abuja on a 5-count charge of bordering on issuance of dud cheque and criminal breach of trust to the tune of N30 million. John and his co-accused allegedly in 2013 paraded themselves as members of the Federal Government Ad-hoc committee on the sale of the Federal Government of Nigeria Houses in the FCT with the intention to defraud innocent people of their hard earned money. The offence is contrary to Section 8 (a) (b) (c) of the Advance Fee Fraud and other Fraud related offences Act 2006, and punishable under section 1(3) of the same Act. Upon his plea, counsel to EFCC, Rimansomte Ezekiel asked the court to fix a date for trail and remand the accused in prison custody pending trial. Justice Otaluka granted bail to the accused person in the sum of N5million with two sureties in like sum. The sureties, who must be resident of Abuja must be a level 12 officers in active civil service and must provide evidence of their official identity and salary account details. The judge, while fixing March 21, 2017 for commencement of trial ordered the defendants to be remanded in Kuje Prison pending perfection of their bail terms.